This veteran sweets shop was founded eighty years ago. It’s located at the corner of the major crossroads in Gion. 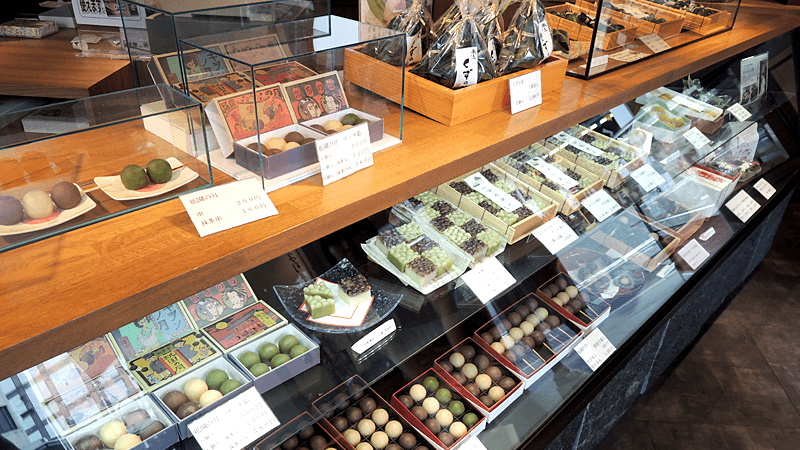 The landmark is the white walls and the display of "Gion no tsuki" dumplings arrayed in a glass case. Popped onto skewers, these make the perfect grab-and-go food. Do give "Gion no tsuki" a try. The red bean paste has a mild sweetness and will lift up your spirits after a long day of walking. These round dumplings are designed to look like the moon. The soft dumplings have red bean paste inside. They’re bite-sized and easy to eat. They come in two colors, but the taste is the same. “Uiro” is a steamed sweet with a toothy texture. Like "Gion no tsuki", they are bite-sized and easy to eat. At left is one with red beans, and at right is one made with green tea. Green tea flavored jelly with a jelly-like texture. It contains collagen, which is held to be good for the skin. Before you eat, pour a bit of sugar-free cream on top. This sweet features red bean paste wrapped in chestnut. Each one is hand-wrapped in a green bamboo leaf. Each and every sweet has an expiration date of that day only. Eat them up soon! If you plan to keep strolling, try the "Gion no tsuki"; if you want to eat something back at your hotel, the Hitokuchi Minazuki is a good choice. The shop is narrow, with just two clerks. When it gets crowded, you may have to wait, so just wait your turn and order. This place has to be most famous for their Gion no Tsuki, Gion's Moon! It is a little bit different from a normal rice dumpling. The mochi rice cake is covered with red bean paste, and the brown (red bean) and green (matcha) rice dumpling look really cute. Their small size and reasonable prices make them a great snack to have if you get hungry while shopping. 10:00～24:00 *Sundays and holidays : open until 22:00. Tends to get crowded in the evening on holidays. Some parts of the menu are in English.